Italian wedding harpist Siena, high level professional. 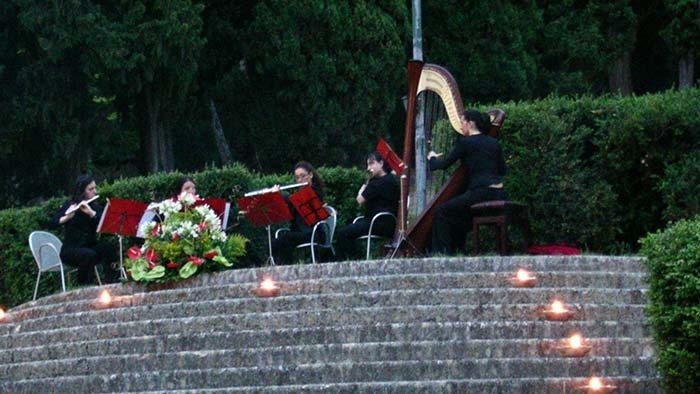 Italian wedding harpist available for aperitifs and ceremonies in Tuscany (provinces of Siena and Arezzo, Chianti), Umbria, Rome and Lazio. All Italy. The harpist is a high level professional. She has a beautiful and extensive repertoire and she is able to learn and play songs on request. She’s also available together with other musicians as harp duo, harp and flute, harp and oboe, harp and cello, harp and organ, harp and string trio, harp and trumpet and harp and voice. There are many different formations available with more than 2 musicians and voice. Below some video samples with harp solo, harp and violin, harp and voice. This incredible musician has a perfect pitch, a gift that very few active musicians can claim to have. This means he can identify the frequency of musical notes without the aid of a reference sound, such as a tuning fork. Raised in a family of musicians, the Italian wedding harpist is a senior professional, one of the best in Italy. She’s available for weddings in Umbria, weddings in Tuscany, weddings in Rome and Lazio and obviously throughout all Italy. She is involved in various important national symphonic orchestras and innumerable string ensembles and is available for the musical entertainment of any kind of wedding reception. Wedding ceremony, wedding aperitifs or wedding dinner. 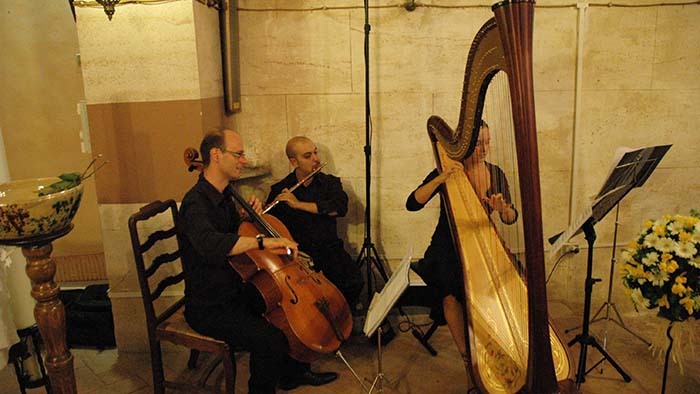 The Italian wedding harpist Siena can play both during church weddings or during civil ceremonies in municipality. She also performs during outdoor weddings. Thanks to her remarkable talent, she plays her harp at religious ceremonies, civil ceremonies and blessings. She also performs during cocktail receptions, wedding dinners and any other type of event that requires a musical background with a beautiful and romantic sound of the harp. She is well known in Italy and abroad thanks to her wonderful performances which are always a great success. The Italian wedding harpist always makes a difference and is greatly appreciated. A great talent with a magnificent touch and a sparkling musicality that has already given much joy to countless couples throughout the world. 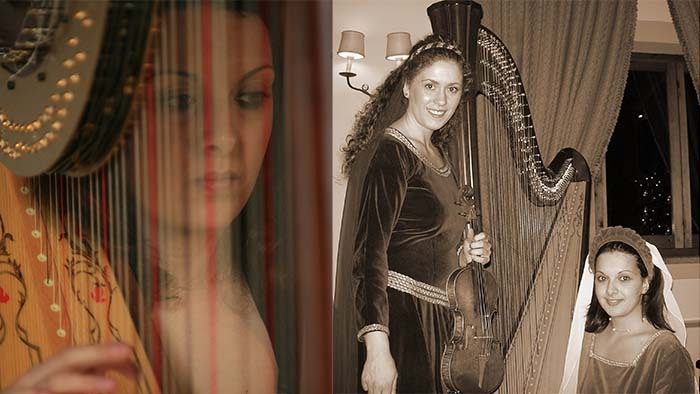 In the photo below the Italian wedding harpist Siena in trio harp, flute and cello. In the photo below the Italian wedding harpist Siena with one of her ensemble.